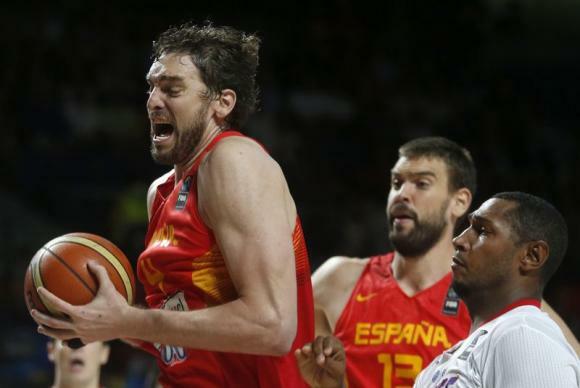 Spain centre Pau Gasol has doubts about his future with the national team following the hosts’ shock quarter-final defeat by France at the basketball World Cup on Wednesday. The Spaniards, packed with NBA talents and joint favourites with the United States, were expected to reach the final but the contest against France which began with fans in festive spirits ended with calls for coach Juan Antonio Orenga to resign. The defeat could well mean the end of an era for a successful Spanish side who lifted the 2006 World Cup, bagged silver medals at the last two Olympics and won two of the last three European Championships. “You never know when it is your last game or your last tournament,” Gasol told reporters after the 65-52 loss. The Chicago Bulls player has been the talisman for the side but he, like several others in the squad, are approaching the end of their illustrious careers. “I would like to play until I am 50 but I doubt I will. It is an honour to play for my country but you never know…We have great young players coming through and I am sure that we will have a strong side for the future,” said the 34-year-old. “It is a painful defeat. We had big hopes and up until now had been playing very well. The 50 rebounds that they took compared to (Spain’s) 28 is a massive difference. They dominated this area and we didn’t move the ball around. Gasol, who faced France carrying an injury, was one of the few players to come out of the game with some credit but was unable to lift the team. His brother Marc Gasol had travelled back to Barcelona the previous day for the birth of his daughter and looked disorientated and lost in both defence and attack. Serge Ibaka also had a poor match as he continually failed to find the basket with throws from distance and was unable to hold France back with his usual intensity in defence. Spain guard Juan Carlos Navarro felt his team mates were complacent. “Everyone thought we were in the final before we played the games. It is clear that we did not prepare well for the game as we should have done and now the final has passed us by,” the 34-year-old told reporters.